Buhera South legislator Cde Joseph Chinotimba is overcome with emotion alongside Jimmy Musapukira and Anna Musapukira at the bedside of Noriah Musapukira at Parirenyatwa Hospital yesterday. Noriah was attacked by hyenas in Chin’ombe Village, Chief Nyashanu’s area in Buhera over the weekend. FIVE people, including a 10-year-old girl, were seriously injured after they were attacked in separate incidents by a stray hyena in Buhera on Tuesday afternoon.The victims are admitted at Parirenyatwa Hospital in Harare, Mutare General Hospital and Murambinda District Hospital in Buhera where they are reportedly in critical condition. Noria Musapukira, a Grade 5 pupil at Muchuwa Primary School who had her right eye plucked out, right buttock mauled and has bruises all over her body, is admitted at Parirenyatwa Hospital. She was on her way home with a relative, Melody Mundopa (17), while coming from Mutiusinazita market when the incident occurred at around 5pm. Noria’s aunt, Mrs Anna Musapukira, who was travelling with the two from the market, said she separated with them when she passed through Mutiusinazita Township while they headed home. “I was walking with them and they told me that they did not want to pass through the township,” she said. “I passed through the township, but Noria and Melody used another route. 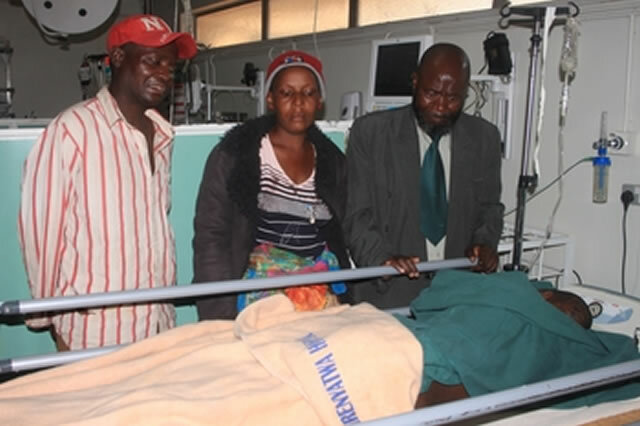 Mrs Musapukira said when they realised that it was a hyena, they fled, but Noria fell whereupon the hyena attacked her. Melody managed to flee from the scene shouting for help and other villagers rushed to the scene. They scared away the hyena which attacked the second victim, a man who was on his way from Mutiusinazita market, a few minutes later. The man reportedly wrestled the hyena until it fled to a nearby homestead where it entered a kitchen hut where a family was sitting. In the kitchen, the hyena attacked a woman and her husband struck it with an axe. It fled and along the way it attacked a soldier who was walking alone in a nearby bushy area. Buhera South legislator Cde Joseph Chinotimba said after attacking the soldier, the hyena went to another nearby homestead where it entered the kitchen hut and attacked another man. The man shouted for help and attracted other villagers who helped him to strike the hyena, resulting in its death. The five victims were taken to Murambinda Hospital and Noria and a man who were seriously injured were taken to Mutare General Hospital for treatment. Noria was yesterday afternoon transferred to Parirenyatwa Hospital. Cde Chinotimba said most villagers had put up security measures to ensure their livestock were not attacked during the night. “I would like to appeal to the relevant authorities to ensure that they also put up adequate measures to ensure that people in Buhera are protected from these wild animals,” he said. Cde Chinotimba pledged to assist those in hospital with medical bills. Buhera villagers believe that a number of wild animals roam the large swaths of land in the district and at one time requested the Parks and Wildlife Management Authority of Zimbabwe to intervene.